Unfortunately, this workshop has been cancelled. 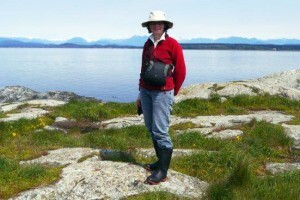 The Comox Valley Horticultural Society welcomes Joan Carrigan as guest speaker to the March 21 meeting. Joan is a basket-maker with a focus on exploring ways of weaving with plant materials. Her presentation will cover how cultures throughout the world for millennia have used available vegetation such as barks, vines, roots, and grasses to make baskets. She will highlight how she sustainably harvests and prepares local plant materials on Salt Spring Island to make both functional and sculptural baskets. For the past 25 years, Joan Carrigan has been making, studying, and teaching basketry. Her passion for baskets has led her to explore many different techniques and materials, both traditional and sculptural. Her inspiration comes from the plant materials she respectfully harvests from nature. Joan’s work has been exhibited nationally and internationally. For more information on Joan and her basketry skills, visit her website at: www.joancarrigan.com. Notice: The basketry workshop scheduled for Sunday, March 20th, has been cancelled. Our speaker will be Krista Kaptein, Co-ordinator of Programs and Volunteers at the Strathcona Park Wilderness Centre, which is operated by Strathcona Wilderness Institute Society. In our own backyard, we have this unique area of subalpine fens and meadows with rare and unusual flora. Krista will also offer us some history of Strathcona Park and background on the Strathcona Wilderness Institute. Rhona McAdam, poet, holistic nutritionist and gardener, author of Digging the City: An Urban Agriculture Manifesto”, will be our guest speaker. She will speak on the decline in nutritional values of fruits and vegetables and the farming practices which are contributing to this, including the toxins which are finding their way into our food through the agricultural system. She will also speak about growing, preserving and storage methods that can boost nutritional values. Her books will be available for sale at the meeting. Submits a monthly report to a Director before Executive meetings, or attends Executive meetings (first Wednesday of every month, except July and December). Submits a monthly report to a Director before an Executive meeting, or attends Executive meetings (first Wednesday of every month, except July and December).